What’s in a name? If you would have asked me what Factotum 90 was a couple days ago, I would have no clue. After spending a few hours with Factotum 90 by TACS Games, I can now describe it easily: Charming, rewarding, relaxing and fun. It’s the latest in a recent wave of Wii U games coming to Xbox One, and it definitely deserves a look from puzzle game fans. The game takes place aboard a recently crashed space station. You control two spider-looking robots through the eyes of a security camera; your goal is to reach the elevator at the end of the room with both robots. The player is aided by Tacs, a worker aboard the ship who gives you general instructions and tips on navigating the environment. Reaching your goal requires the robots to work as a team by pressing switches, aiming light beams, transporting boxes that hold buttons down, and traversing through portals. You can only control one robot at a time and at any point you can reset either robot to its original position at the beginning of the level. Every level also has a data collectable that you can grab with a little extra effort. By the end of the game you will hopefully have restored the ships vital functions and find out what happened to everyone on board. Controlling these bots is very simple and intuitive, although when I first started playing it felt very cumbersome. The bots basically have tank controls ala the original Resident Evil games. There’s no strafing and no full 360-degree camera with the right analog stick. As I played more the controls became second nature and I realized it doesn’t make sense for these robots to control like a hovercraft; although I still longed for 360-degree views with the camera. To be fair you can move the camera slightly with the right thumb stick. You are always able to see both robots at all times and switching between them is just a simple Y button press. The X button is used to grab objects, A is for interacting with switches and B resets your robot at the beginning of each level. You can also control the robots with the analog stick or the d-pad, a nice touch for those who prefer one control style over the other. Factotum 90 is unimpressive when it comes to graphics and sound, most levels look and sound the same. The Wii U version had a greenish monochromatic filter, on Xbox One everything is in color which I found to be a welcome change. Frankly I don’t think you are playing this game for the graphics, it’s all about the puzzles and the graphics that are in place do a respectable job. The sound is about what you would expect from a sci-fi robot game. Lots of beeps and boops make up the basic soundtrack. It would have been nice to have another song or two playing during the levels. There is voice acting from your guide which I wasn’t expecting. The robots even talk to each other in their own robot language which is actually quite cute. I tend to avoid puzzle games because typically I do well at first but then I get stuck, frustrated and end up quitting. With Factotum 90 I felt at ease playing, even when I had to restart a level. There wasn’t that sense of anxiety for me because what you see is what you get. There are switches, portals, buttons, laser beams and you just need to start tinkering around and you will find your way. The levels also don’t take very long to finish, especially at the beginning. It’s a great game to boot up for a few minutes if you’re short on time, finish a level or two, and come back later. Another pair of great choices by the developer are the price of the game and the achievements list. The game is available for the asking price of $5.99 and even cheaper during launch week. There are twelve achievements and they are all easily attainable through just playing the campaign and if you’re impatient you can choose level select and spam them as well. For six dollars you’re getting a fun puzzle game and likely a nice 1000 Gamerscore in your profile. If you’re in the market for a puzzle game on Xbox one, you can do a lot worse with your money than Factotum 90. Watching someone play or reading a text review doesn’t do the game justice. There’s a rewarding sense of accomplishment when you’ve completed a level; you might even find yourself finishing this game in one sitting. 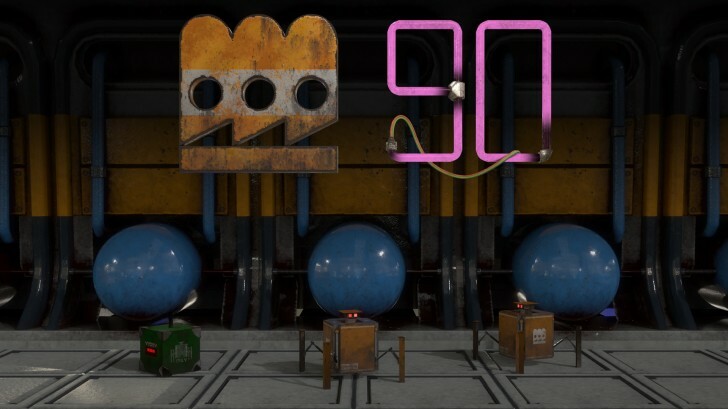 Factotum 90 may not be the flashiest puzzle game on Xbox One, but it’s one that is definitely worth your time.